A review of Science and Society in Medieval Islam: Nasir al-Din Tusi and the Politics of Patronage, by Hadi Jorati. With his extraordinary grasp of the source base in both Arabic and Persian, Hadi Jorati’s dissertation is an important contribution to understanding the obscure career of perhaps the most important Muslim thinker of the thirteenth-century, the luminary scholar, Naṣīr al-Dīn Ṭūsī (d. 1274), who served as the director of the Marāgha observatory in Ilkhanid Iran. A philosopher, theologian, mathematician, and astronomer, Ṭūsī is best known for his advances in theoretical astronomy. Throughout this dissertation on Ṭūsī set in the political and historical context of the Ilkhanate (ca. 1256-1335) of western Asia, and in particular, Iran, we are reminded about the importance of revisiting the textual problems of our sources, even well-known works that have been edited and published. Jorati examines how the often turbulent and contested politics shaped the source base for the life and times of Naṣīr al-Dīn Ṭūsī in a variety of complicated ways. Indeed, Jorati convincingly demonstrates that the most essential first step in revising our patchy and often inaccurate understanding of Ṭūsī’s life and career is disentangling the knotty problems of the highly ideologically charged source base. Not only have historians of the Ilkhanid period generally eschewed this difficult task, but the editors of the texts in question also neglected to properly address these important textual issues. The contemporary and near contemporary biographical reports and historical narratives have led to a wide array of discrepancies, contradictions and conflicting interpretations. Pointing out that “no serious scholarship can be done without proper attention to textual problems” (p. 21), Hadi Jorati sets out to contextualize and analyze the plethora of reports and anecdotes on Ṭūsī, and various issues with which he was involved, with the aim of producing a coherent narrative. Naṣīr al-Dīn Ṭūsī (d. 1274)’s career may be broken down into two major periods: his early adult years spent in the safety of the Isma‘ili fortresses in Iran following the initial Mongol conquest in the 1220s. This period came to an abrupt ending with the second phase of the Mongol conquest of Iran in 1256-1258 under Hülegü, the founder of the Ilkhanate. Ṭūsī joined the Mongol enterprise under Hülegü and came to serve as director of the observatory he had built in Marāgha. In five chapters Jorati explores the sources and their textual problems, as well as Ṭūsī’s career, with an emphasis on its unclear and controversial aspects. Five appendices follow with a selection of texts of the primary sources with annotated translations. Each of these chapters tackle the problematic source base in an effort to clarify Ṭūsī’s often misunderstood role in events as well as his relations with different patrons. Through contextualization as well as comparative source criticism, Jorati untangles the various contradictory, conflicting, and often conflated biographical reports and historical narratives, and places them in their historical and political contexts. The dissertation opens with an excursus into the sources (“Historiography and Writing History: Textual Criticism of the Primary Sources”), leading into a focused discussion on the textual problems of the most relevant sources. Pointing out that “[t]he ultimate root of much of the textual problems is obviously the complicated history of the Mongol campaigns in the West in the first place” (p. 7), Jorati focuses on the Persian narratives, the most important of which are the two contemporary and near contemporary works, ‘Alā’ al-Dīn ‘Aṭā Malik Juwaynī’s Tārīkh-i Jahāngushā and Rashīd al-Dīn’s Jāmi‘ al-Tawārīkh. Due to the existence of differing recensions, revised at different times and under different circumstances, these works contain conflicting information even within the same text. Jorati stresses the supervisory role played by Jāmi‘ al-Tawārīkh’s attributed author, Rashīd al-Dīn. Rather than being a single work by one author, the Jāmi‘ al-Tawārīkh should rather be understood as a set of different histories produced by a team of different compilers in a workshop environment – a situation which explains the unevenness of quality, detail and completeness of different parts of the work. Thus, rather than thinking of the text in terms of a definitive text, the Jāmi‘ al-Tawārīkh actually consists of a corpus of interrelated and overlapping texts, all of which are equally definitive or authentic. Jorati points out that Juwaynī’s Tārīkh-i Jahāngushā was compiled in a similar way. These and other textual issues, however, were not taken into consideration in the production of modern editions and translations which have contributed to the confusion. Jorati raises another key textual issue: how the sources reflect the biases of the Ilkhan-Mamluk ideological divide in the interpretation of key events, depending upon which side they fall on. The remaining chapters deal with various aspects of Ṭūsī’s life grounded in rigorous source criticism. The second chapter (“Tusi and the End of the Caliphate”) tackles Ṭūsī’s role in the fall of Baghdad in 1258, perhaps the most controversial aspect of his career. Pointing out that there are few detailed studies of the fall of Baghdad and the murder of the last caliph al-Musta‘ṣim (r. 1242-58), Jorati criticizes the most recent ones for limiting their sources to the Arabic accounts (Hend Gilli-Elewy, 2000). 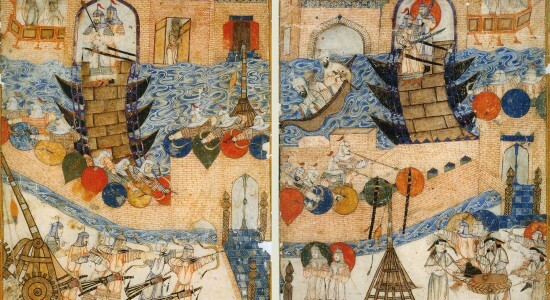 The Mongol campaign against Baghdad, Jorati observes, exemplifies the problem of conflicting reports. In order to arrive at an alternative narrative, Jorati compares the two different textual traditions, the Arabic accounts with the Persian ones, and juxtaposes their divergences. The result of this exercise leads him to dispel the misconceptions that Ṭūsī rose in Hülegü’s regime immediately as a vizier in reward for betraying the Isma‘ilis of Alamūt and for conspiring with the Caliph’s vizier against the Abbasid regime. The third chapter (“The Isma‘ili Career of Nasir al-Din Tusi”) delves into Ṭūsī’s relations with the Bāṭinī Isma‘ilis of Iran, in whose castles he resided for twenty-five years. During this time Ṭūsī produced some of his best work. Nevertheless, since Ṭūsī left few traces of this seminal period of his life, his intellectual production as well as the major points of his career remain obscure, including how and when he became associated with the Isma‘ilis. Jorati convincingly argues that Ṭūsī later, under the Mongols, consciously distanced himself from the Bāṭinī Isma‘ilis, “rebranding” himself as a captive rather than voluntary follower, having sought refuge in the mountain fortresses during the tumultuous period of the initial Mongol invasions of Iran. Hadi presents the following historical reconstruction: as the Mongol armies first approached Iran, Ṭūsī fled Khurasan to the west, spending time at Isfahan, Ray, and then Mosul. Jorati presumes that Ṭūsī subsequently went to Baghdad in search of employment, contacting the caliph’s Imāmī vizier. When nothing came of this, he set out for Iran again, and joined the Bāṭinīs as a convert at the lowest ranks. He subsequently rose in position and stature, and relocated to Alamūt, where the royal Isma‘ili court resided, allowing him close proximity with the center of power and access to the magnificent libraries for which Alamūt was famed. Jorati carefully reconstructs Ṭūsī’s role in the events by tracing the factional politics at the Isma‘ili court in Alamūt. He contrasts Rashīd al-Dīn’s version of Ṭūsī’s role in the surrender of the Isma‘ili leader to Hülegü with Juwaynī’s earlier account, which remains entirely silent on Ṭūsī’s role in these events. Juwaynī’s silence is due to ideological reasons: the text’s main emphasis is portraying Hülegü as a conqueror by the sword, not by word. Rashīd al-Dīn’s version, on the other hand, presents Hülegü’s dealings with the Isma‘ilis through diplomatic initiatives. Not only does this emphasis on diplomacy allow for Ṭūsī’s role in the surrender (he was responsible for convincing the Isma‘ili ruler to surrender), but also for Rashīd al-Dīn’s own family’s role: his grandfather and grand uncle had long been in the service of the Isma‘ilis at Alamūt as physicians. By linking his family with the peaceful Isma‘ili surrender and presenting them as loyal servants of the Ilkhanate from the very beginning, Rashīd thus serves his own political ambitions. Chapter four, “The Maragha Period: Tusi and the Ilkhans,” covers the final sixteen years of Ṭūsī’s life as director of the observatory in Marāgha and head of the awqāf of the realm. By comparing conflicting reports in both Persian and Arabic, contrasting their points of divergence, and setting them within the context of the Ilkhan-Mamluk conflict, thus identifying their partisan biases, Jorati argues against the modern consensus based on Arabic accounts. These depict Ṭūsī as a Mongol collaborator rewarded with the position of vizier by Hülegü for having betrayed first his Isma‘ili masters and then the caliph. Jorati stresses that Ṭūsī never served as Hülegü’s vizier, but only as an informal advisor, and rose to his post as the result of his expertise in astronomy and mathematics, subjects which were greatly valued by the Mongols. After discussing how the observatory project came about, stressing Ṭūsī’s role in initiating it as a way to distance himself from imperial politics, Jorati delineates the political connections and the lines of patronage that Ṭūsī sought until the end of his life, emphasizing that the unstable political life at the Ilkhanate never allowed for stable patronage. Jorati points out that “Tusi was never fully settled at Maragha, and that he constantly sought alternative sources of patronage…” (p. 141). Ṭūsī established intimate relations with the ‘Alā’ al-Dīn Juwaynī, governor of Baghdad, and the leaders of the Iraqi Imāmī community. Jorati also touches upon the overlooked yet significant issue of Ṭūsī’s travels to Quhistan and Baghdad. Tusi died on his second trip to Baghdad in 1274. That he had with him a large entourage, including family members, associates and students, suggests that he intended to permanently settle in Baghdad, perhaps in an attempt to distance himself from imperial politics. In the fifth and final chapter (“Conclusion: The Ubiquitous Search for Patronage”), Jorati recapitulates his arguments and reconstructions of Ṭūsī’s career and motives, pointing out how Ṭūsī’s life can best be “understood in the context of his constant search for the best available patronage in a time of political turmoil…” (156). This study does not profess to be a definitive biography and largely leaves Ṭūsī’s intellectual achievements untouched. The aim rather is to clarify Ṭūsī’s involvement in the political life of the period, and to link his intellectual production to the political context of patronage. By sorting through a pool of divergent reports, Jorati attempts to make sense of Ṭūsī’s life and professional career. Not only does Jorati shed valuable light on the complexities of the source base, but he offers strategies on how to read these texts by understanding the narrative function of anecdotes, many of which over time took on a life of their own, and became further obscured with new layers of narratives and counter-narratives. Furthermore, by comparing Ṭūsī’s Isma‘ili period with that of his Ilkhanid one, Jorati identifies Ṭūsī’s search for patronage as a unifying thread of his career. He was able to attain the patronage of the Ismaʿilis by relying on his expertise in Aristotelian philosophy; under the Mongols, his expertise in astrological matters gained him protection, employment and influence. Of note is Jorati’s analysis of Ṭūsī’s innovative use of the legal construct of endowments (waqf) for funding the observatory, which had the advantage of freeing Ṭūsī from the whims of an individual patron. Particularly valuable in shedding light on how Ilkhanid politics shaped patronage matters is Jorati’s detailed reconstruction of Ṭūsī’s triangular relations with the Juwaynī brothers, and particular ‘Alā’ al-Dīn, the governor of Baghdad, and the Imāmī community of Iraq, one of the Juwaynīs’ major bases of support. Indeed, the important yet little understood role of the Shi‘ite community in Ilkhanid politics and intellectual life awaits further study. With this rich treatment of these diverse topics firmly grounded in textual analysis, Jorati foregrounds his examination of the political and social factors shaping Ṭūsī’s intellectual career as an attempt to better understand the social background to intellectual activity in the eastern Islamic world. Rashīd al-Dīn al-Ṭabīb. Jāmi‘ al-Tavārīkh, ed. Abdulkerim Ali Oglu Alizada, 3 vols. Baku: Azarbayjan CCR Elmler Akademiyasy Neshriyyaty, 1957-1980. Waṣṣāf al-Ḥaḍrat: Sharaf al-Dīn ‘Abd Allāh ibn ‘Izz al-Dīn Faḍl Allāh ibn Abī Na‘īm Yazdī Shīrāzī. Tajziyat al-Amṣār wa Tazjiyat al-A‘ṣār (Tārīkh-i Waṣṣāf). Edited by Īrāj Afshār, Maḥmūd Umidsālār and Nādir Muṭallabī Kāshānī. Tehran: Nashr-i Ṭalāya, 2009; lithograph edition, Kitāb-i mustaṭāb-i Vaṣṣāf al-Ḥaẓrat dar bandar-yi Mughūl. Edited by Muḥammad Mahdī Iṣfahānī, Bombay, 1269/1853. Ibn al-Fuwaṭī. Talkhīs. Majma‘ al-Ādāb fī Mu‘jam al-Alqāb, ed. Muḥammad al-Kāzim. Tehran: Wizārat-i Farhang wa Irshād-i Islāmī, 1955; ed. Muṣṭafā Jawad, 3 vols., Damascus: Dār al-Kutub al-Ẓahīriyya, 1962. Yale University. 2014. 252pp. Primary Advisors: Dimitri Gutas and Abbas Amanat. Image: Heinrich von Diez Albums, Conquest of Baghdad by the Mongols 1258, Double-page illustration of Rashid-ad-Din’s _Jami’ at-tawarih_ Tabriz, 1st quarter of 14th century. Water colours and gold on paper. Original size: 37.4 cm x 29.3 cm (right), 37.2 cm x 29 cm (left). Staatsbibliothek Berlin, Orientabteilung, Diez A fol. 70, p. 4 (right) and 7 (left).